What Color is Your Pocketbook? Judith Lieber’s purses are works of art as much as any painting or sculpture I have ever seen. Last week, with my friends Linda and Dorothy, I visited the Michener Museum in New Hope, PA, and we were all amazed at the beauty and delight of Lieber’s extraordinary creations, from the trapezoidal-shaped purses of satin and leather to the unique purses in the shapes of animals, fruits, and vegetables. She seemed to draw her creativity from whatever she found interesting and her pocketbooks literally sparkle from that creativity. At 85, I believe that Judith Pieto Leiber is also an inspiration to several generations of women, proving one can succeed despite hardship. She spent World War II in hiding and was denied studying science because of her Judaism. That loss became the fashion and art world’s gain. She was the first woman to achieve Master status in the Hungarian handbag artisan guild while still living in Europe, and then found success here in the US after immigrating with her American husband, Al Gerson Leiber. After working for several other handbag companies, she started her own company in 1963. In viewing her handbags, starting with the lovely first purse, a silver chatelain created in 1967, to the subsequent handbags worn by first ladies Nancy Reagan, Barbara Bush, and Hillary Rodham Clinton, my friends and I remarked that the pocketbooks were timeless. Anyone of them could be worn today and still be considered â€œin style.â€ Just as a painting or a sculpture can be timeless, so are her creations. If the collection comes to a museum close to you, don’t miss it! Not all pocketbooks are works of art, like Judith Lieber’s. However, I believe that they do reflect the wearer’s personality. The title of my blog this week, What Color is Your Pocketbook? is a spin-off, or knock-off (as are some of Lieber’s purses) of the book entitled, The 2006 What Color is Your Parachute? by Richard Bolles. First published in 1970, it is considered THE guide for job hunters and career changers, and is updated almost every year. His title came from the answer he gave to friends who told him they hated their jobs and were ready to bail out. He would then ask the friend, So what color is your parachute? 1. Steam pita for a couple of minutes to make it pliable. 2. Cut in half. Line each half with a large lettuce leaf. 3. Place all the minced, chopped and sliced veggies in a bowl. Drizzle with olive oil, lemon juice, and chopped garlic to taste. 4. 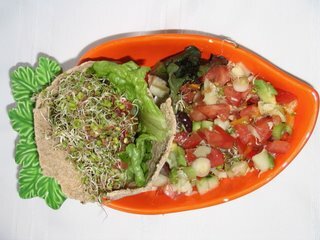 Then place several tablespoons into the leaf-lined pita bread halves. 5. Top with sprouts and enjoy. Should be enough to stuff 4-6 pita halves. (Sources for this article: Judith Lieber collection at the Michener Museum, New Hope, PA: Inside Magazine, Spring 2006; and www.jwmag.org/articles/05Winter02/p.10 asp. (photos included). NOTES: 1. There is an online company that allow you to lease an expensive purse for a period of time. See www.frombagstoriches.com/StoreFront.bok. 2. I will be away from April 27-May 13, so there may not be a blog next week. I hope to have one in time for Mother’s Day. About 5 a.m. I threw off my nightgown. Must have been a post-menopausal hot flash, or a power surge, as my youngest daughter would say. It lasted only a couple seconds, but sleep would not return. Light was already streaming through my windows, and the morning was cool and inviting. Early mornings are my favorite time of day, anyway. As I threw off the sheets, I decided to bake cookies—in the buff. O.K. O.K. I confess. I did don an apron. Not sure why, since my skin is totally wash and wear. Habit, I guess. Oh, yes, I do have on my lucky cap, a little rose-colored crocheted number I picked up at The Gap about five years ago for $2.00 on sale. Back to the cookies….Or maybe back to the buff. By the time one reaches 60, all the rules are subject to scrutiny. Who made these rules anyway? When my kid sister turned 50, she said, “I don’t play by the rules any more. I’ve done it all my life and life isn’t fair, so I’m going to make my own rules.” She’s smarter than I am; I didn’t wake up until after my divorce and I was already 55. I think I was on stupid pills instead of vitamin pills! Even if I had burned the cookies beyond recognition, when my fire sign-Sagittarian tendencies are in full force, baking in the buff is an experience I plan to repeat. After all, if I survived menopause and divorce at the same time, and have finally reached The Crone Age with its sidekick PMZ (Post-Menopausal Zest), I’m entitled! You can mix and match the grains, sweeteners, nuts and spices to your taste. 4. Drop by spoonfuls onto lightly greased cookie sheets. Bake for 12-15 minutes, until cookies are slightly brown on the bottom. 5. Remove and cool before eating in the buff. Yield: approximately three dozen small cookies, depending on the size of your spoon! You are currently browsing the Menupause weblog archives for April, 2006.